Click to enlarge. 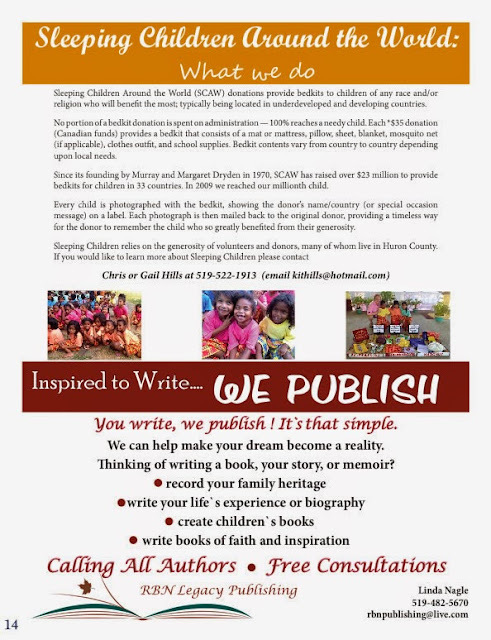 | Contact Chris or Gail Hills. As posted by the Oakville Beaver, May 7, 2015. 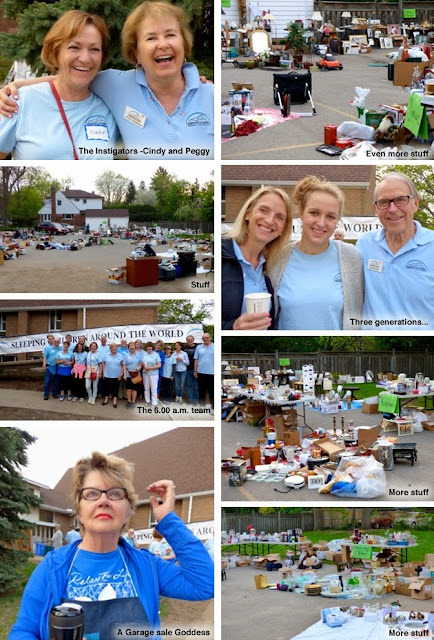 Huge Garage Sale for Sleeping Children Around the World, 8 a.m., Grace Evangelical Lutheran Church, 304 Spruce St., all proceeds go to bedkits for children in developing world, contact Cindy at cindyhobman@gmail.com or Peggy at peggy.morrison@cogeco.ca. Results of the sale submitted by Cindy Hobman. The garage sale proved to be a bigger success than we could have ever imagined. Thanks to all the wonderful volunteers for their hard work, enthusiasm, relentless energy, and constant smiles. Without them, this could never have happened. Special thanks to Grace Lutheran Church in Oakville for their hospitality and for lending us their facilities. Almost $5,000 was raised. 136 children in developing countries will receive bedkits as a result of this effort. Click photos to see larger version. About our Seventh Pinehurst Breakfast. 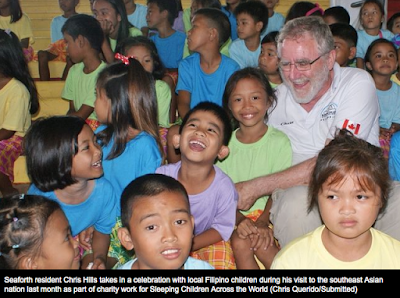 Chris Hills spent the better part of the first three weeks of April crisscrossing the vast island nation of the Philippines, helping to distribute about 5,000 bed kits to needy children residing in some of the country's most impoverished communities. As part of his ongoing volunteering efforts with Canadian charity Sleeping Children Around the World (SCAW), the Seaforth resident was once again afforded the opportunity to hand-deliver the valued aid packages, which contain 38 crucial necessities such as mosquito nets, toothbrushes and school supplies. He also distributed 28 bed kits purchased with donations generated from a SCAW fundraising dinner held in Clinton back in late March. Hills, who has now visited the Philippines three times for SCAW, remains upbeat about the impact the packages can have for impoverished children there, most of whom live in simple tin roof shacks in the country's derelict, typically flood-marred slums. Even the sourcing of the products benefits the country, he explains, with the items contained in the kits produced in the Philippines. “All of the items are manufactured and/or sourced in the Philippines, so that provides a boost to the local economy,” Hills said in an interview after returning from the trip, which ran from April 3 to 19. Members of the charity’s Philippines-based partner group assisted Hills and six other Canadian volunteers as they ventured out to 16 different locations across Luzon, the country’s most populated island. In addition to delivering the kits, the volunteers conduct interviews with recipient families to see what other items they would want included in the packages and to gain a firmer picture of their living situations. Despite most residing in “grim” dirt floor dwellings often located in active flood plains, Hills noted that the families remained remarkably positive in the interviews even as they described the challenges of living in extreme poverty. The interviews also provide powerful imagery for subsequent presentations by the volunteers back in Canada detailing the importance of the work they do, Hills said. “As you learn more about (their) everyday life, you’re better prepared to paint that picture for people,” he added. Hills points to school supplies as being among the most popular items in the care packages, stating that children there are greatly enthusiastic about the prospect of attaining a formal education. Although there is no cost to attend elementary school in the Philippines, supplies for classes are not provided and must be independently purchased. It’s a cost that can be especially burdensome for the families served by SCAW, most of who barely eke out a living pillaging scrapyards for pop cans and other recyclable goods, Hills said. As a travel leader for the charity, Hills is entering the last of his four-year term visiting the Philippines. After next year, he will be shipped off to another yet to be determined nation served by SCAW. Hills acknowledges that it will be difficult to say goodbye to the “dedicated” local volunteers and parents and children he met while stationed in the southeast Asian country. SCAW claims to be one of a few Canadian charities, if not the only one, to allocate all fundraising revenue to its services and programs. Declaring itself the 100 per cent charity, it guarantees that all bed kit donations reach a needy child. Administrative expenses at SCAW are reportedly covered by a legacy fund set up by founder Murray Dryden. It does not conduct telemarketing or mass mailing campaigns. The cost of a bed kit is $35. For a donation of that cost, a donor will receive a photograph of a child with the bedkit, showing the donor's name and country on a label. In addition to the Philippines, SCAW also provides bed kits to an array of developing countries, including India, Bangladesh, Togo and Kenya. Since its incorporation in 1970, it has donated about 1,415,000 bed kits.